Air ambulance companies have continued to add air bases, particularly in the Southern and Western United States, even as they hiked their average charges by more than 60%. The findings by the Government Accountability Office show how costs for patients and insurers have continued to jump despite state efforts to control balance billing for emergency flights. Regulation of emergency air transport falls to the Federal Aviation Administration, so the courts have so far largely struck down states' attempts to rein in the cost burden on patients. The median price charged in 2012 was about $22,000 for a helicopter transport and nearly $25,000 for a fixed-wing ride. Now it's more than $36,000 for transporting patients via helicopter and nearly $41,000 for fixed-wing ride, the GAO reported. Air ambulances are also not subject to regulatory controls like certificate-of-need laws, active in 35 states and the District of Columbia, which put a check on new medical facilities coming into a market. One consultant who has worked for years on air ambulance issues told Modern Healthcare in October that air ambulance companies exploit this gap. Without limits on the number of bases a company can build, emergency air transport providers can keep adding to their fleet and raise their charges to make up for the fact the number of patients needing transport isn't increasing at the same pace. 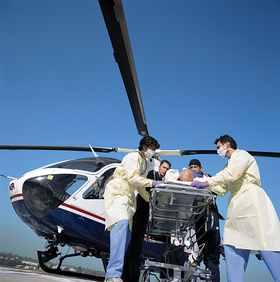 The air ambulance market is increasingly falling to private equity groups. For example, Valley Med Flight, which is one of North Dakota's largest medical transport companies, re-branded as Guardian Flight. It is a subsidiary of Air Medical Group Holdings, owned by the global investment firm KKR along with five additional sister air ambulance companies. The GAO backed up the consultant's claim. The agency looked at data from 2012 and 2017, and found that air ambulance companies added fixed-wing bases and helicopter bases during that time period. There were 146 fixed-wing bases in 2012, versus 182 bases in 2017. There were 752 helicopter bases in 2012, and 868 bases in 2017. The GAO analysts asked air ambulance companies why they decided to open new bases, and one such provider said it "evaluates the need" by asking area hospitals about "the number of transports they typically require and the length of time it takes helicopters to arrive to pick up patients." Western and Southern states hold most of the bases, and about 60% of the new helicopter bases and about half the new fixed-wing bases were built in rural areas. GAO found that just under half of the new helicopter bases were added to regions that overlapped with existing air ambulance coverage by more than 50%. However, the agency noted its analysts spoke to some stakeholders who said the new helicopters "may help enhance available services by, for example, being able to respond to a call if the existing ambulance resources are in use or otherwise unavailable." "On the other hand, as we have previously reported, some air ambulance providers told us that when helicopters are added to bases in areas with existing coverage, those helicopters are not serving additional demand," the GAO said. This finding backs up a remark by Aaron Todd, CEO of the air ambulance operator Air Methods Corp. Todd acknowledged in a 2015 investor earnings call that the number of transports may exceed market need. "And if you ask me personally, do we need 900 air medical helicopters to serve this country, I'd say probably not, maybe 500, 600 could do well, but it's an open market, these are—we don't have certificate-of-need restrictions," Todd said, according to the call transcript on Seeking Alpha. The high charges have involved state insurance commissioners and insurance companies. The GAO noted that consumer complaints in North Dakota — a state where surprise charges provided by Blue Cross and Blue Shield of North Dakota and reviewed by Modern Healthcare ranged from $26,000 to nearly $534,000 over the past four years — have fallen off since the state legislature passed a law to halt balance bills. A federal court struck down a previous North Dakota law passed in 2015 that required air ambulance companies to enter network contracts with at least 75% of the state's health insurers. A federal judge struck down the law in 2016 when an air ambulance company sued the state for violating the Airline Deregulation Act of 1978 that leaves air transport regulation to the federal government. The state tried again with a 2017 law, now in effect. It is also under litigation by a medical transport company but judgment is still pending. Congress would need to change the law to regulate the charges, a proposal pushed by former Sen. Claire McCaskill (D-Mo.) last year. She secured a provision in the 2018 Federal Aviation Administration reauthorization bill to require a panel of stakeholders to review policies and increase price transparency, but the crucial measure to allow states to address the consumer cost question was dropped.